Which Supplements Help Heal a Broken Ankle? Patients may find the standard treatment for a broken shoulder more focused on passive remedies, such as pain relief, than on active surgical repair. That's because the majority of clavicle, or collarbone, fractures involve clean breaks that can mend on their own. According to the Cleveland Clinic, less than 20 percent of these injuries will require manipulation or surgery to set the bones in the proper position for healing. The uninjured anatomy on the affected side must be kept comfortable and fit while the shoulder heals. The regenerative properties of bone tissue allow rifts to mend when the area remains adequately stable. The body's natural musculoskeletal stability, however, disappears after a bone fracture. Paramedics and emergency room physicians restore that condition by immobilizing broken shoulders. The American Academy of Orthopaedic Surgeons notes that a break results in a sagging shoulder, which must be set back into alignment in order to heal. If bone fragments are not displaced, a shoulder wrap and sling may complete this treatment. If the collarbone or portions of the humerus arm bone have been shattered, medical personnel may need to manipulate the bones back into place and secure them artificially with pins or other devices. Patients will have to move the injured shoulder as little as possible but maintain mobility in the arm, elbow, wrist and hand during recovery. Doctors or physical therapists will provide guidelines for rest and flexibility exercises. While a broken shoulder may take as long as 12 weeks to heal, according to the University of Buffalo Sports Medicine group, the advantage of this rest period is pain relief rather than additional bone stress. Ice therapy, the classic athletic treatment for traumatic injury, works for any adult or child who suffers a collarbone fracture. Immediately following the injury, pain and swelling may be intense for several days. The UB Sports Medicine group recommends cold pack applications of up to 30 minutes in three-hour intervals for inflammation and pain relief. Patients can supplement cold compresses with pain relief medication to control their discomfort. 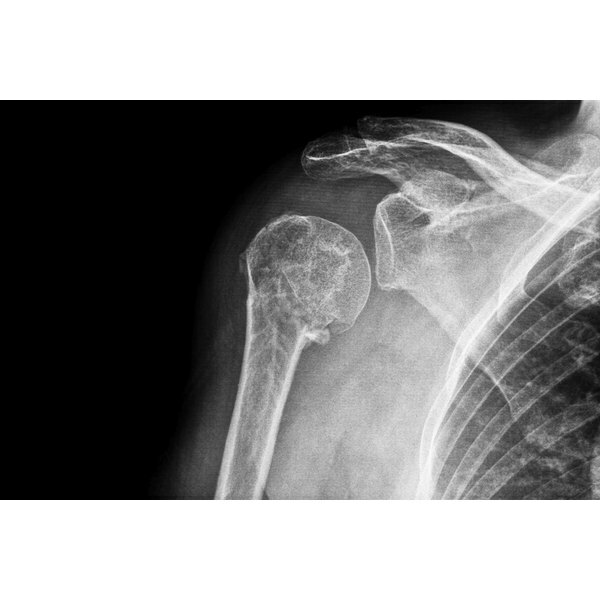 The American Academy of Orthopaedic Surgeons suggests ibuprofen, acetaminophen or aspirin for pain following a collarbone fracture. Doctors usually perform surgery soon after a bone fracture in the shoulder to reconstruct a healthy posture. Displaced bone fragments will be rearranged while the patient is anesthetized. The Cleveland Clinic notes that damaged joint or muscle tissue adjacent to the broken shoulder may also require surgical repair. What Is the Recovery Time for Shoulder Replacement Surgery?